(From Lowe's website)If you are interested in learning a little bit more about me, here are some of the things that went into making me the sort of writer I am today. I was born and raised in London, England, where I spent a rich, fantasy filled childhood developing a love of good books. One of my favorites was The Little White Horse by Elisabeth Goudge which I vividly remember reading under my desk during math class. There are some wonderful descriptions of food in this book and I still want to eat sticky parkin and bread and honey every time I reread it! Visit her website here. Girls, we've all been there, haven't we? Wanting to do something so desperately, but our mothers don't approve? That's exactly what's bothering Cat Campbell. Though a late bloomer, Cat has inherited her mother's (the protagonist of The Power of Poppy Pendle) gene of witchcraft, something that she's longed for since she could attempt to mix a potion in her mom's bakery. Unfortunately, though expected, Cat's mom disapproves of Cat's magic. Until Cat turns eleven, Poppy is sure her daughter has not inherited the witchcraft gene, but Cat finds her mother's wand and changes two things forever: her witchcraft has begun, and spiders actually aren't that bad. Of course, Cat doesn't get to enjoy her magic too long because the dreaded, most awful witch has escaped from Scrubbs prison. 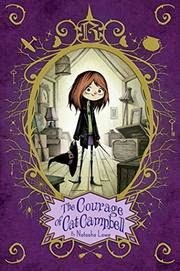 Learning to face her worst fears from The Late Bloomer's Guide to Magic, Cat must prove to her mother that she can handle going to Ruthersfield and prove to herself that she can control her magic and the chaos around her. Not since Harry Potter has an author created such an enticing world of wizardry, and it's nice to see the point of view of a young girl who is just now discovering herself and her abilities. The "spells" at the end of the book are so charming, and I found myself wanting to try some Courage Potion myself. School starts back on Monday, and I'm about to teach a whole new bunch of kids!